Somethin Wonderful: 11 Interesting Facts about Tigers - Did You Know? The tiger (part of the Felidae family) is a beautiful and majestic creature. Tigers are highly adaptable: they can be found in, from the Siberan taiga to the tropical mangrove swamps to grasslands. 1. Most tigers have more than 100 stripes, and no two tigers have the same stripes. 2. The roar of a tiger can be heard from over a mile away! 3. 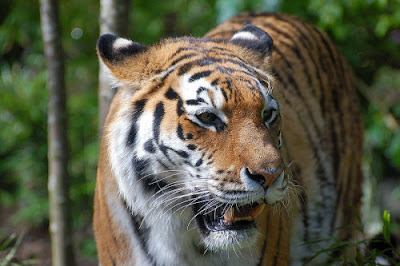 The Siberian tiger (photo above) is the biggest of the nine subspecies [outlined above]. These beasts can reach an average head and body length of 190-230 centimetres (75-90 in). They can weigh up to 300 kilograms. Now that’s a beast! 4. A tiger marks its territory by spraying trees and bushes (contained inside the territory) with its urine, and also leaves deep scratches on tree trunks. 5. One averaged sized tiger can eat upto 60 pounds of meat at a single time! 6. A tiger’s canine teeth can grow up to three inches long, easily capable of crunching through the spine of any creature on Earth: like a warm knife through butter. 7. The tendons in a tiger’s leg are very strong: even after being shot dead, a tiger was known to have remained standing. That’s strength. 8. A tiger is diurnal, which means its peak times of activity are dawn and dusk. 9. A tiger eats around six kilos of meat per day, but can go as long as a week without a meal. 10. A tiger’s saliva is antiseptic, and comes handy when a tiger cleans its wounds. 11. A tiger’s striped coat is perfect for camouflage, among tall weeds and grass. Also, if you were to shave all the fur off a tiger’s skin, the stripes would still remain!